It’s impossible to overstate the change in Heart ‘n Home Pinning Ceremonies in Central Oregon since we gained Vint and Bob as Volunteers. Both of them live in La Pine and are members of the La Pine Band of Brothers, which is an amazing organization, made up of Veterans who want to support other Veterans. These guys have traveled to Bend to perform Pinning Ceremonies and have even come up with special ways to honor our Veteran hospice patients. Our Veteran patients now become Honorary Brothers or Sisters in the Band of Brothers, and receive a special extra pin and certificate. Bob has added his special touch to the ceremonies by thanking the spouses of the Veterans, saying, “Your support made serving our country possible.” The way these two have shared their passion for honoring Veterans with Heart ‘n Home has made me tear up every single time we have a ceremony. They have only been on our team since March and they have helped to make these ceremonies something incredibly special. I am thankful for them. 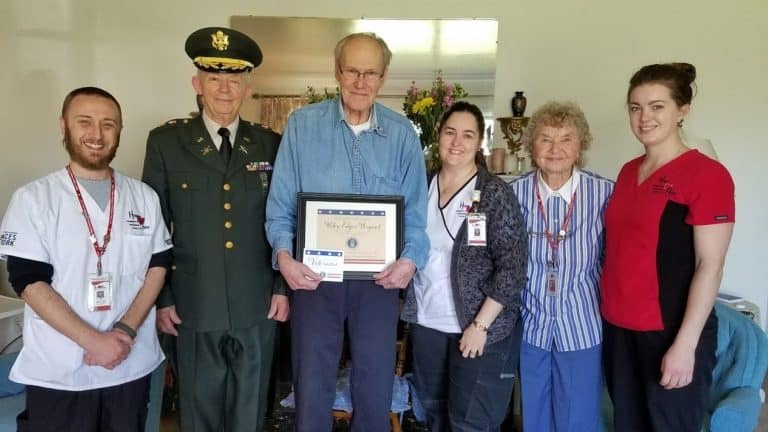 The volunteering they do for our Veteran patients is incredible. The brotherhood between Bob and Vint and their patients is something that nobody else could replicate. There’s an acceptance, a quiet knowing, and an understanding of the sacrifices and the loss that these Veterans have experienced. I hope that every Veteran patient gets to have a Vint or Bob at their side during their hospice journey. If you are interested in becoming a Veteran-to-Veteran Volunteer, contact us today!